I was disappointed that the pacing was off in this one too. 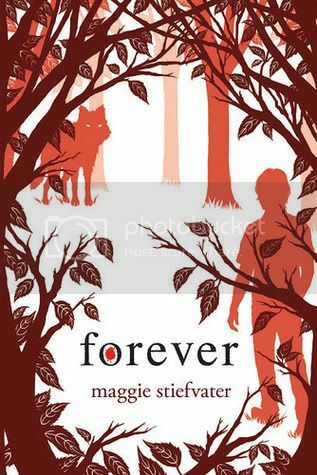 I still like Maggie Stiefvater's writing and look forward to her next book. Nice review! Great review! That's too bad that there wasn't tons of action in the first half of the book. I still haven't gotten a copy and I kick myself everytime I see a review! I've only read Shiver and I don't intend to go further in the series. The story was complete for me in that volume, especially given what I've heard about Linger. What you're saying about Forever makes me think I made the right choice. Though I'll probably read a spoilery review (if I can find one) just to make certain there's a happy ending for Sam and Grace. I thought this was a great ending to the series too. I love Cole and think he grew so much as a characters. I feel sort of similar to Rubita - I really loved Shiver, and it seemed like a complete story for me. I'm hesitant to go any further if it's going to ruin my feelings for the series, although I do own Linger and have Forever coming at some point. I'll have to think on it, but I'm very glad to know that the ending was a decent way to go. Great review. I didn't realize it when I was reading it, but you're right about how Sam doesn't do much of anything. I would totally buy a series about Isabelle and Cole, too!